On March 11th, 2011, Great East Japan Earthquake stroke Japan causing massive tsunami and nuclear accidents, and many of our members had lost their loved ones including their dogs as well as homes. The show venue, Makuhari Messe was also partially destroyed, and its surroundings suffered from the liquefaction damages which resulted roads to be impassable due to severe cracks and unlevel grade. However, Makuhari Messe is now repaired which able us to hold our show. Although the number of entries was 928 dogs, a little less than last year, many dog fanciers from Tohoku district kindly joined us in spite of their devastating loss from the catastrophic earthquake. In order to enrich the audiences’ understanding of the dog show and to gain more dog fanciers, we, the JKC Chiba Block Council board members planned the dog show guide tour and set up the booths for the obedience training and consultation corner for dogs. When the group judging started in the afternoon, the atmosphere got more excited. After all the group winners were selected, the BIS judge, Mrs Doris Cozart picked a female Poodle (Toy) “MAGIC FANTASY JP SECOND MOVEMENT” as the Best In Show, and a male Afghan Hound “ZAZA GRAZIOSO JP CRIMSON KING” as the Best Dog In Show (King). 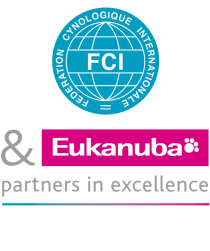 And then, this year’s first FCI International Dog Show in Japan was successfully closed. We extend our sincere appreciation to all the people concerned.